This post was sponsored, and paid for, by Radius Bank. All opinions are my own. The first time you open a bank account, it may have been under the guidance and direction of a parent. That likely means you had very little influence in which bank was chosen to hold your money. But, when you become an adult, everything changes. You take charge of your own well-being which, of course, includes your finances and all other aspects of your life. If you decide to change banks, or have to because you moved, you want to look for a bank that has your best interests in mind. To help you make the best possible choice, here are six things to look for in your new bank. Paying monthly fees on your bank account stinks. That’s why no monthly fees are one of the first things you should look for in a bank. There are banks that only charge a monthly fee if the combined total of all accounts drops below a certain dollar amount or if you jump through a bunch of red tape to meet the requirements. However, it’s best to avoid banks that charge any kind of monthly fee if you can help it. Read over the details of all the documents you are given carefully before you sign contracts or agreements with any bank. You may find that some banks have fine print that can result in fees you may have overlooked at first. They may hide fees within other charges or services. To avoid hidden fees, ask for a comprehensive fee schedule that covers everything you could be charged for. You should look for a bank that doesn’t hit your account with fees every time you need to withdraw money from an ATM. Of course, it’s pretty standard for most banks to waive fees on “in network” ATMs. If you can, try to find one that reimburses you for the ATM fees you may be charged by other banks as well. Having this benefit on my account has saved me a ton of money over the years! The Radius Hybrid Checking account offers free ATMs all over the world and reimburses ATM fees from other financial institutions on a monthly basis. Another feature to look for in a bank is an account with no limit on the number of transactions you are allowed to make each month. Moving your money around with withdrawals, deposits, transfers, and other transactions should not cost you extra. As you search for a bank, look for one that does not require you to carry a minimum balance. Some do, which means you need to keep your balance above a certain level in order to avoid being charged a fee. They may also close your account if you don’t meet the minimum balance. The worst part is that for checking accounts with high minimum balance requirements, your money is just sitting there earning little, if any, interest. However, there are banks that offer accounts without minimum balance requirements and come with some other great perks. For example, you could get a Radius Hybrid Checking account online. This account has no monthly maintenance fees or minimum balance requirement beyond the $10.00 it takes to open the account. To earn interest at a rate of 0.85%, you do have to have a balance of at least $2,500, which is important to note. Read our full review of the Radius Hybrid Checking account here. Overdraft protection is another critical feature worth looking for in a bank. Some financial institutions will charge as much as $35 if you overdraw your account. When your checking account gets hit with just two or three of these per month it makes a big dent in your budget. At many banks, you can avoid these charges if you link your savings account to your checking. When your checking account balance drops too low, the bank will automatically transfer a certain amount from your savings account to cover the transactions instead of charging you a costly overdraft fee. It’s standard for most banks to offer savings accounts, debit cards, automatic withdrawals, and automatic deposits. But not every bank offers assistance that goes above and beyond the usual services. Radius Bank will help you with more than just routine banking. For example, they can help you budget your money, analyze your spending, and get instant alerts right on your phone. The additional tools they provide can meet financial needs many other banks don’t. Plus, with a virtual bank like Radius, you don’t need to change banks every time you move. You can take your bank with you instead! No matter why you may be looking for a different bank, you always want to get the best services at the lowest cost possible. 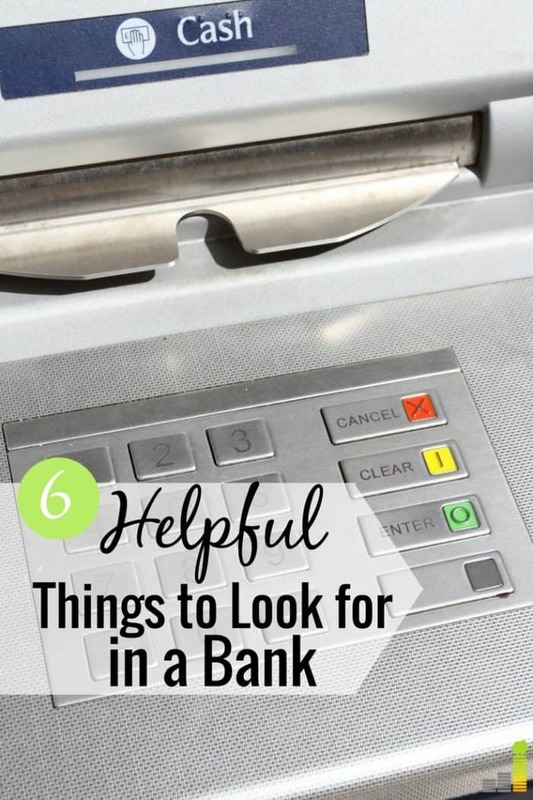 The post 6 Things to Look for in a Bank appeared first on Frugal Rules.